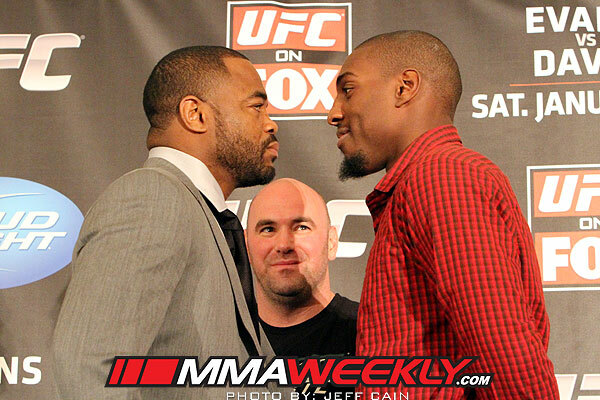 The Ultimate Fighting Championship on Saturday night returned to Chicago for UFC on Fox 2: Evans vs. Davis. The card featured a triple-bill that aired live on Fox, while the preliminary bouts aired live on Fuel TV as part of the promotion’s new seven-year contract with the Fox family of networks. UFC on Fox 2 drew a reported attendance of 17,425 fans to the United Center, the home of the NBA’s Chicago Bulls and the NHL’s Chicago Blackhawks. The gate for the event was $1.2 million. UFC on Fox 2 featured Rashad Evans vs. Phil Davis in the main event, and Chael Sonnen vs. Michael Bisping and Demian Maia vs. Chris Weidman in the co-main events. UFC 90 featured Anderson Silva defending his middleweight title from Patrick Cote in the main event.